The Ultimate Morocco tour takes you on a splendid journey through the Sahara sand dunes, the magical cities of Fez and Casablanca and the ancient Berber Villages. You can experience the true nature of Morocco through this tour as the journey unravels the rich history, culture and geography of this beautiful country. On the Ultimate Morocco tour you will travel from the sprawling beaches to the ancient mountain ranges that have stood the test of time. We, at Top Morocco Travel are a luxury travel agency in Morocco and we can arrange a superb Morocco tour for you at most affordable prices. Our Morocco holidays packages let you experience the rich history, culture and the geography of Morocco: You can visit the casbahs and lose yourself in the magical and memorable vistas of Morocco. The Ultimate Morocco tour takes you from the ancient cities to the majestic beaches of Morocco, making this tour a memory of a lifetime for you. 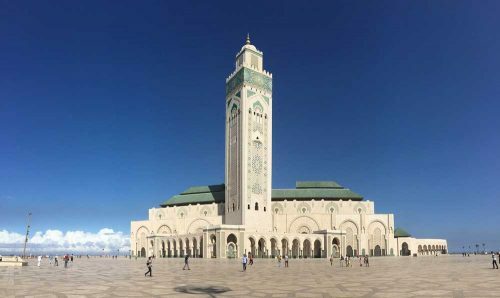 During this trip, you will see the famous Casablanca attractions like the Chellah Gardens, Medina, and Beth-El synagogue, Royal Mausoleum Mohammed V, Hassan II Masque, Habbous Quarter and United Nations Square. After visiting these magnificent destinations you will be taken by a private car to the capital city of Rabat. The city of Rabat contains the principal royal residence and it is also the capital of Morocco. You can relax after your journey by visiting the gardens and beaches of Rabat that are famous for their breathtaking views. The tranquil sceneries of Rabat will leave you spellbound by their beauty. After Rabat, the next stop is the city of Meknes. The former capital city of Morocco, Meknes is a city with a history that spans back hundreds of years. The medina walls of the capital have gates that feature with beautiful craftsmanship that is considered to be the best-preserved examples in the whole world. Moulay Idriss is a whitewashed town in Morocco that is known as the founding place of the Arab dynasty in 787 AD. At the outskirts of the city, you can visit the ruins of Volubilis that was a popular Roman settlement until the 4th century. After Meknes, you will move to the city of Fez. Fez is the city which is popular as a religious and intellectual place. You can go on a tour of the medieval medina that is a UNESCO world heritage site. The medina is famous for its winding lanes and artist workshops. You can also visit the Royal Palace of Fez and Mellah which is the largest Jewish Quarter in Morocco. The old mosques and the open air tanneries of Morocco make for a great visit. You can also shop for handicrafts and traditional items made from ceramic, copper and leather. The tour then takes you to the Middle Atlas Mountains. The Middle Atlas Mountains present a wonderful view of the pine and cedar forests, Berber villages and terraced farms in the way. The lunch for this leg of the journey will be in Midelt, a small village where you can buy minerals and fossils that are put on display by local vendors. The tour will take through Ziz valley, where you can enjoy the breathtaking views of dramatic escarpments, plunging ravines and palm-filled gorges of the valley. Ahead, the oasis region of Erfoud welcomes you where you can bargain over hand loomed Berber rugs with the local traders. You can reach the Sahara Desert through the nearby Merzouga, and explore the sand dunes on camelback. Your journey will continue through the Dades Valley, where you will travel on the ancient caravan trading route. The overnight stay will be in Ouarzazate, which is a thriving trading post for the modern day Hollywood of Morocco. The snowcapped mountain peaks of the High Atlas Mountains are next, which is the largest mountain chain in Africa. The fortified village of Ait Ben Haddou is next, which is also a UNESCO world heritage site and made famous by the filming of movies like Lawrence of Arabia and The Last Temptation of Christ. The Ultimate Morocco tour makes its finale in the pink city of Marrakesh. You can tour the fabulous local souks and enjoy shopping there. The royal palaces, scenic gardens, and the historic monuments make Marrakesh a city worth visiting. The city comes alive after sunset with exciting performances by snake charmers, magicians, and storytellers at the public square Djemaa El-Fna. You can visit the seaside town of Essaouira which is a former Portuguese settlement famous for water sports like windsurfing and its pristine beaches. You can enjoy a memorable dinner at a centuries-old palace to mark the end of your journey. Accommodations: We arrange the best of luxury hotels and Riads to make your stay comfortable. Luxurious rooms, exquisite suites, and state-of-the-art amenities of these luxury hotels will leave you spellbound. Contact us to request the complete itinerary for the above Morocco tour, or customizing your own itinerary.